Choose between 6 different knit shapes - which can make different kinds of shawls, scarves, cowls, wraps, kerchiefs, dishcloths, tops, blankets - and 24 different stitch pattern options to knit your custom sized items in any weight yarn! Mix and match the stitch patterns as you like, or use fortune telling items to choose randomly. 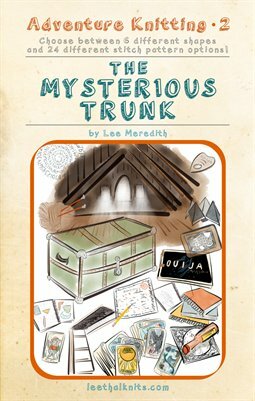 All stitch patterns are both written and charted, and the book is complete with an adventurous story about finding the mysterious trunk! Learn more, and download the supplementary PDF with the printable fortune telling items, on leethalknits at http://www.leethalknits.com/patterns/adventure2.html or find lots of details and project examples on ravelry!